Oxygen is widely used in emergency medicine, both in hospital and by emergency medical services or those giving advanced first aid, both chronic and acute cases, and can be used in hospital, pre-hospital or entirely out of hospital, dependent on the needs of the patient and their medical professionals’ opinions. 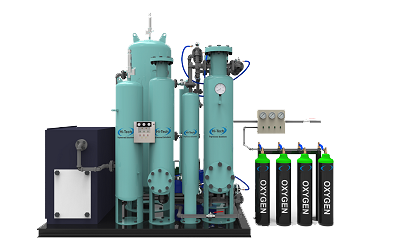 Medical Oxygen Generating System has been designed to produce oxygen onsite and fill high pressure cylinders (up to 3000 psi) or to supply oxygen directly at up to 70 psi. 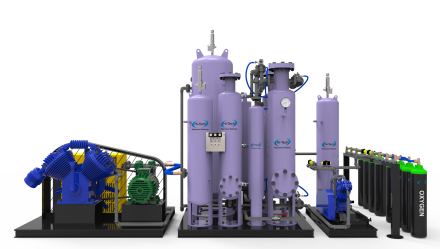 This system uses oil-free air compressors and modular oxygen generators for redundancy and reliability. The system produces Medical Grade Oxygen in accordance with the US / EN Pharmacopeia specifications. Oxygen Plant based on pressure swing adsorption (PSA) Technology used for charging cylinders/bottles up to high pressure of 2900 PSI for MIlitary Defense & first responders.